Frozen is all about defying expectation and convention. Looking at the marketing campaign for the film you really don't get much of a sense of what the story is (very similar to Pixar's usual tactics in fact) and what we do gather from the commercials we've seen and the pictures plastered all over Wal*Mart and Target is that this is more than likely a new Princess tale from Disney looking to capitalize on the good will of both Tangled and Wreck-It Ralph as those two films have come to be revered with much more excitement than anything Pixar has produced in the past few years. Going into the film, I wasn't overly sure of what I was getting myself into, but the early word of mouth that praised it as being the best Disney animated film since Beauty & the Beast or the The Lion King was certainly something that caught my attention. If nothing else, I was now curious to see how the film would measure up against these other films that shaped my childhood and are nothing short of classics in my mind. Frozen does indeed fit nicely into the library of what Disney has brought us before in terms of beautifully realized castles and princesses with funny supporting characters to lean on and charming princes or underdogs that rise to the occasion, but as I said earlier it is also all about defying those expectations and it is those variations on the structure, those added moments where the characters within the film look at each other as if to say what every grown-up in the audience is thinking, that make this all the more delightful and all the more fulfilling than simply being another knock-off of the early princess stories that made Disney the brand that it is. Disney animated films have always been able to transcend age groups and trends, but what makes this film work along with its past couple of efforts that differentiate it from something like Treasure Planet is that it is no longer trying to be cool or stay with the times, but is instead playing by its own rules and letting the magic flow without any caution as to what might be widely accepted and in return is being rewarded handsomely. New Queen Elsa (Idina Menzel) is finally allowed to embrace her special abilities. We open on the kingdom of Arundel and encounter the two young princesses of said kingdom, Anna (eventually voiced by Kristen Bell) and her older sister Elsa (eventually voiced by Idina Menzel). They are siblings, but they are clearly friends and the camaraderie we see in the early scenes here is catapulted to other levels due to the fact Elsa has special powers that allow her to manipulate ice and pretty much create anything she can imagine from it. It is on one of these innocent nights where the girls play up the advantages of Elsa's power that things take a turn for the worse and Elsa hits Anna with a blow of her abilities that renders her unconscious. Their parents, the King and Queen, rush the two young ones to the only beings they know might be able to help, a group of trolls buried deeps outside the forrest of the kingdom. It is here they learn a strike to the head or anywhere else on the body can be cured by removing the memories of the powers, but a strike to the heart is almost irreversible. As Anna was not hit in the heart there is a sense of relief, but Elsa continues to feel deep guilt and a fear she will never be able to control her powers thus rendering the friendship with her sister non-existent. She can't remind Anna of her powers and she can't take the chance of hurting her again and so she locks herself away until she is forced to come out. This leads to the manipulative way in which we have been pitched the story. Yes, Arundel does wind up in an eternal winter and yes, Anna joins forces with a rogue ice dealer named Kristoff (Jonathan Groff) who has a faithful reindeer sidekick named Sven and together they go off to find Elsa and try to convince her to lift the curse on the kingdom, but this factors so little into the bigger picture I was pleased to come away with several revelations that I didn't see coming. The marketing for Frozen clearly doesn't want to give away too many plot points so I won't either, but the case in point for what makes these alterations to the classic way in which Disney tales unfold comes from the fact that the film is able to take the theme of love, something that has been used in almost every movie ever, and seemingly come at it from a new perspective that at the very least will feel fresh and give the younger minds in the crowd the lesson that there are many ways to look at one thing. This may seem like an odd comparison coming from the outside, but if you saw Rush this past September, the one starring Thor and the guy from Inglorious Basterds, than you might have a sense of what Disney has done in Frozen. Granted, that film was rated-R and this is an animated cartoon that comparison will fail to connect with the target audience for each film, but per the chance you've seen both you know that Rush didn't take a good vs. bad look at its two opposing lead characters, but instead presented the reasoning as to why one approached the sport from his perspective and why the other found his approach more effective. This could be said about the pair of Anna and Elsa as well. Lucky for us, Elsa's plight is never made out to be something that turns her from an inherently well-intentioned person to an evil witch or in short, a carbon copy of Maleficent. No, what we have instead, is just like that theme of love and how it is approached from a different point of view and how it might be interpreted several different ways. We have the origin story of how Elsa might have come to be perceived as the villain while also coming around a complete one-eighty and having the redemption tale through the ever-optimistic and extremely loving Anna. The way in which this is accomplished is that instead of stretching out what could have been a series of films, writer/director Melissa Lee (Wreck-it Ralph) and her co-director Chris Buck (Tarzan) have combined the strongest elements of those archetypal stories that usually come in threes and in giving them each a compounded view so as to give each character a stronger arc and a better payoff for each of them in the end they have a final product that never slows and consistently offers surprising turns. This efficient pacing is due as much to the storytelling as it is the characters involved and there are no shortage of interesting and appealing sorts here. Still, the core relationship between the sisters is established first thing and for good reason as throughout the film we are given subtle hints of how true love isn't always fairy tale princes and grand gestures, but in most cases comes from those who we don't think of in romantic ways, but who instead know us better than anyone else. Kristoff (Jonathan Groff) finds an unexpected friend in Princess Anna (Kristen Bell). It is a difficult thing to move forward while honoring where you came from and this film is able to pull it off with ease. What will really test the endurance and just how much of a milestone this film becomes though is the one thing we are unable to know as of right now and that is to see how it holds up over time. I'm not old enough to remember how well I caught onto the songs of Beauty & the Beast or The Lion King the first time I saw them in theaters, but at least two of the tracks in Frozen were immediately ones I could tell would stay with me. A number near the beginning in which Elsa and Anna transition from young girls to young women titled, "Do You Want To Build A Snowman" and Idina Manzel's rousing take on, "Let It Go" both had me grinning from ear to ear due to the pure bliss and creativity that seeped out of every line and animated movement that went along with them. It is impossible to know if the songs will stick or if they become as memorable as others is the Disney canon, but as the first straight-up Disney musical in several years this is a welcome return to form and a step in the right direction should Disney decide to continue making musicals and enlisting the husband-and-wife songwriting team of Robert Lopez and Kristen Anderson-Lopez who wrote the songs for this film. You never know, they could turn into the next Ashman and Menken. 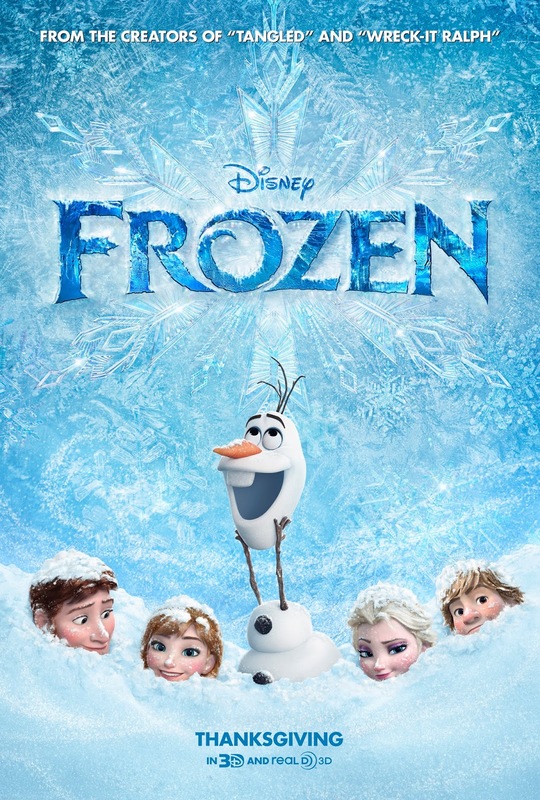 And before we go, we must discuss Olaf who is the cute little snowman you've seen in almost every trailer and piece of advertising for Frozen. He is voiced by the always funny and always pleasant Josh Gad who infuses this obligatory sidekick with genuine humor while not being allowed to over-indulge in his characterizations or play out his one note joke about loving summer. Instead, the creative team wisely keeps him hidden for a fair part of the first half of the film only to have him come in and buddy up with Sven to create an almost slapstick pair that deliver the laughs while never detracting from the essential drive of the plot. It is another decision that derives itself from the standard archetypes of these films while offering a refreshing aspect on it and that is what Frozen is all about, making us feel warm inside by showing us what we want is what we expected, turned on its head.